Join Amp Art at YSP to hear the British Museum`s Venetia Porter, Curator of Islamic and contemporary Middle East in conversation with Syrian artists Issam Kourbaj and Sara Shamma to discuss their work and the role of art in the context of the Syrian conflict and the capacity of art to heal and catalyse change. Art, in all its forms, is both crucible and catalyst for awakening civic consciousness, and emboldening both the artist and the viewer. Since the onset of the Syrian crisis in 2011, Syrian artists have been creating work that responds to the upheaval and violence occurring in Syria and on the journeys of displacement – playing a crucial role in documenting and communicating the humanitarian crisis. In the words of Issa Touma, Syrian-Armenian photographer: “The more war they do, the more art we will do.” Foreign-born artists too have been compelled to create works with and for the displaced peoples, giving a voice to those who have been muted. This talk will examine the role of art in the context of the Syrian conflict and the capacity of art to heal and catalyse change. Venetia is a curator responsible for the collection of Islamic art, in particular of the Arab World and Turkey as well as developing the collection of the modern and contemporary art of the Middle East. She was previously curator of Islamic coins in the Department of Coins and Medals. 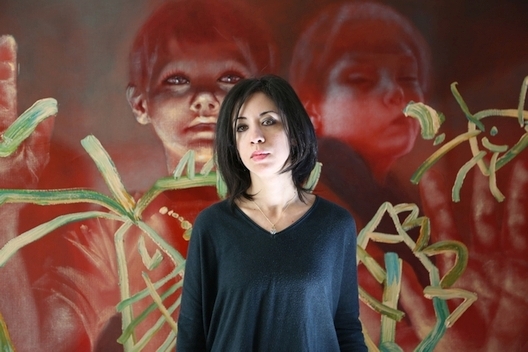 Sara Shamma was born in Damascus, Syria (1975), to a Syrian Father and Lebanese mother, a family of intellectuals. Shamma graduated from the Painting Department of the Faculty of Fine Arts, University of Damascus in 1998. Following her graduation, Shamma participated in a number of solo and group exhibitions in the UK and internationally.